From Chile to Mexico over the last decade, the Latin American Region (LatAm) has joined the Global Entrepreneurial Revolution in full force. Inspired by entrepreneurial developments in Chile––including the now notorious Start–Up Chile seed/acceleration program launched almost a decade ago––comparable government–sponsored innovation programs have sprouted across the LatAm region. Enlightened public/private partnerships have included different actors in the ecosystems, namely two: (a) a myriad of new government regulations strengthening the emerging ecosystems and facilitating the formation of young ventures in the formal economy, and (b) the availability of venture capital from emerging funds and individual angel investors or groups thereof. Over the past two decades, I have had the privilege to observe these developments due to my multiple connections with many actors in the public, private, and academic sectors across the region. Furthermore, the formation of Alaya Capital Partners  (Alaya CP or ACP for short) in 2012 and its sister US–based company, Sausalito Ventures, has enabled conversations with hundreds of potential Limited Partners, and probably thousands of founders of young companies, which consist of ventures still in their ideation stages to firms that are fully established. Furthermore, my location advantage of being based in the San Francisco Bay Area/Silicon Valley enables me to compare, contrast, and connect disparate trends and opportunities, bridging the ecosystems and exploring new opportunities across the Americas. Alongside Alaya CP, there are approximately 50 VC funds in the LatAm region (45 of which are LAVCA  members), mostly in Mexico and Brazil. The emergence of VC funds in Latin America began in the early 2000s, and accelerated in the mid–2000s, particularly in Chile. Over the last 10 years, the pace has continued to grow and expand to all geographies, in particular Argentina, Chile, Mexico, and Brazil, and other parts of Latin America. For all this progress, a critical element is missing in the LatAm ecosystem development: the exits. The exit market continues to be immature for two reasons: reluctant international buyers and ill–prepared local/regional buyers. In this blogpost and the blogpost that follows, I will (i) identify the problem statement of the “missing exits,” which puts the sustainable growth of LatAm ecosystems in jeopardy, and (ii) refine the problem statement illuminating some potential solutions. Over the next 3–5 years, dozens of VC funds will have an approximate total of 100+ Latin startups that are “exit ready” and seeking potential buyers. If successful exits do not materialize significantly in quantity and quality over the next decade, this will represent a lethal blow to the embryonic LatAm VC industry. Its future development would be uncertain, as VC fund administrators will face increasing challenges raising future funds and persuading LPs of the attractiveness potential of their investment theses. The diagram below illustrates the developmental steps of a venture, beginning with the venture’s idea phase and proceeding to its transformation into a fully–fledged business. The mortality rate diminishes monotonically as we move from the ideation phase (–2––mortality close to 100%) into each successive transformational phase, reaching a fully–fledged ongoing concern in the growth phase (3– with amortality probability greatly reduced). During the early formative phases (–2 and –1), the founding team borrows, begs, and “steals” resources and invests their sweat, with the hope that its effort will eventually translate into actual economic value. By Phase 0, family, friends, and angels (FFF & Angels) become the first investors of the emerging venture. 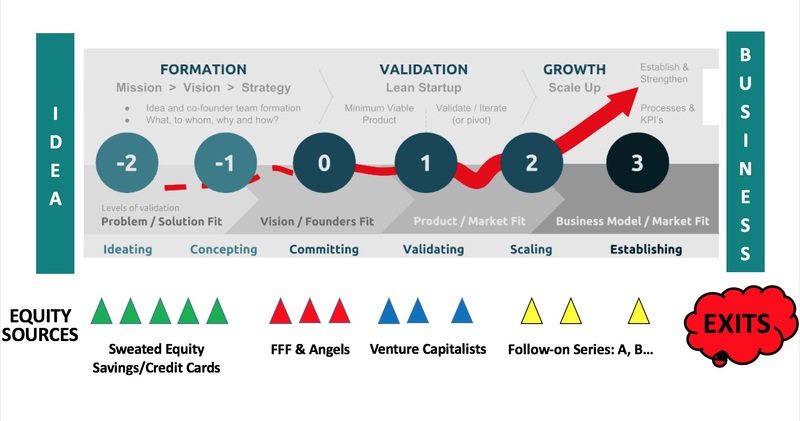 Somewhere in between the validation and the growth phases (1 & 2) is the time when funds like Alaya CP and other VCs invest. Typical valuations of Latin Startups, require VC investments (or group of VCs) somewhere between $150K to $500+K dollars for anywhere between 5 and 20 percent equity in the emerging venture . Once the product or service is validated in a specific market (after Phrase 2 and Phase 3), the venture may require additional funding to support its market expansion and possible global scaling (Series A and beyond). By the time the venture reaches Phase 3, the venture transformation is complete from an idea (phase –2) to an attractive business, and is now hopefully an attractive acquisition target . This constitutes the exitor liquidity event, enabling all those who have invested sweat or money to cash out and hopefully multiply their initial investments by large multiples  for the FFF, Angels, and VCs. Of course, the founding team and the employees who received part of their compensation in equity, are rewarded handsomely here as well. The need to identify buyers (local, regional or global) and successfully complete transactions for dozens (possibly over one hundred) Latin American startups which will be “exit ready” over the next 3 to 5 years, with valuations somewhere in the range between $10MM to $30MM US dollars. The next question is how such a high volume of transactions will materialize. It is important to recognize that their sizes ($10MM to $30MM US dollars) are out of the range of transactions usually processed by established/traditional investment bankers, whose processes are optimized for transactions which are at least one order of magnitude bigger (or more). Transactions over $100MM dollars can support fees in the range of millions of dollars to compensate the sell and/or buy sides investment bankers, lawyers, accountants, tax specialists, and other players supporting these transactions. Clearly, Latin American startup exits cannot support these fees as they would represent transaction costs in excess of 10%. LatAm VCs are compelled to identify creative out–of–the–box solutions to support the quantity of transactions efficiently, with a new breed of investment bankers and all the supporting functions leveraging technology and innovative business models. Finally, LatAm VCs need to work closely with their portfolio companies starting at the moment of investment to have them “exit ready” at all stages of their development. Their accounting and governance need to be in full compliance of the local rules and the USA (particularly Delaware) to be ready to global suitors. Latin American startup founding teams need to persevere in their journeys to develop their ventures to sell them, balancing the goal of monetizing their product/services (and generating greater revenue returns) with the goal of selling ownership of their ventures. The latter goal could be particularly traumatic for many Latin entrepreneurs, since they have a propensity to personalize their ventures (as their babies). I am confident this challenge will be solved. The progress made so far in the development of entrepreneurial ecosystems across the LatAm region is without a doubt impressive. However, it is now clear that there is a need to identify efficient solutions enabling the completion of the key missing element of LatAm entrepreneurial ecosystems: the development of a market of companies leading to successful exits. My next blogpost will identify solutions (and their sub–elements) to the challenge identified in this post––in particular the process of Completing The Latin American Entrepreneurial Ecosystem. Alaya CP was the first venture capital fund formed in the interior of Argentina (outside Buenos Aires). The Latin American Venture Capital (and PE) Association, of which Alaya CP is a member. LAVCA publishes a valuable index, the 2017/2018 LAVCA Scorecard, ranking the state of development of the Latin American Private Equity/Venture Capital markets. A more comprehensive list of indices and rankings (updated this for 2018) can be found at the Sausalito Ventures web site. Establishing a range of pre–money valuations between $750K and $10MM US dollars. The sweet spot are companies with products and/or services (v 1.0) starting to gain traction with paying customers. These startups command a typical pre–money valuations in the range of $1MM and $3MM. Convertible notes are vehicles increasingly used to postpone the need to establish the value of young startups in early developmental phases. Acquisitions are more likely for Latin American startups over the next 5 years. IPOs are not ruled out, but they are not addressed as they are considered unlikely, and if it happens it would be a singular event. These are the expected returns of Latin Startups. Obviously, funds like Alaya CP aim for the highest possible return, aligning the interests of the founding team, FFF, Angels, and other co–investing VCs. A couple of weeks ago, I had the opportunity to spend a day in Sacramento at the Unified Wine & Grape Symposium (Jan 23-25th 2018). It was a fascinating experience. I have participated in dozens, and possibly hundreds of, conferences and industry trade shows around the world. However, this conference was different in almost every respect. For starters, all other gatherings I had participated in related to IT — i.e., some emerging technology in telecommunications, information processing — or related applications. Historically, most of the gatherings I have attended reviewed wholly disruptive products or services that rendered prior offerings obsolete. Furthermore, the products or services at these gatherings were almost always “man-made” sans the direct, explicit participation of mother nature. In most cases, the climate at these gatherings was showy––with multiple languages often overheard in the hallways and Wall Street suits visibly present. Most products or services detailed were only a few years old, and anything beyond 5 years old was definitively a “museum piece”. Wine, often, gets better and more expensive with age. The industry is only a few thousand years old. Furthermore, the grape and wine business is an important part of the economy, particularly here in Northern California. In the US, it is about a $60B per year industry, and here in California, represents 60 percent of the US, and several hundred billion dollars worldwide. Wine consumption worldwide is growing at a faster clip than the global economy, and the average unit bottle price is shifting to premium brands (over $15-20 dollars per bottle). Furthermore, while the United States (US) leads in the rankings of wine consumption, other countries lead in production. The table below highlights the top 10 largest producers and consumers of wine. The wine industry is also unique in that, while the US dominates most IT (information technology) sectors, European countries (Italy, France, Spain, etc.) not only are the leaders of wine production, but historically have brought forth and advanced the industry’s leading technologies. They have exported their know-how, mostly via emigration, to the US and to most of non-European countries, with the exception of China. Wine consumption (and production) in China is a recent phenomenon in part facilitated by globalization and the continued expansion of the country’s middle class. Other emerging countries exhibit the same trend, showcasing a high correlation between middle class enlargement and demand for wine consumption. Nature dictates the tempo of the industry. Grapes are harvested once a year and wine production is followed by an aging process which may last from a few months to a few years. Tradition and experience dominate this process, while science and technology has played an increasing role in adding value, reducing costs, and increasing quality and efficiencies across the value chain in the last century, particularly in the last several decades, post WWII. Incremental innovations galore was my first broad impression perusing the booths of the Unified Wine & Grape Symposium trade show. The range of products on display was mind-boggling, from disparate fertilizers and agriculture machines to advanced tools and bottling labeling equipment. Suppliers for every step of the value chain and every imaginable service was on display. My own professional formation (or deformation) was to look for those disruptive forces3 that would have an impact xN (multiples of N>1), and I really had to look much harder to find those. Precision agriculture is enabling 2, 3, 4 and 6, among others. First examples of managing water, fertilizers, growth rates, etc. are becoming available. Various key building blocks of the wine-making process (such as pumps, sensors, flow meters, et al) are becoming wirelessly “connected,” enabling dashboards and automation; enabling 3, 6, 8 and 11. Software platforms are emerging to enable end-to-end management from the vineyard through production, distribution, and logistics. This is enabling 2, 4, 6, 9 and 10. Direct-to-Consumer (DtC) software and Apps, enabling disintermediation (1), connecting with the consumer directly. Furthermore, this new distribution channel enables a steadfast gathering of information about consumer tastes and preferences (4) to anticipate (8) and personalize (9) the experience, enabling increases in loyalty and revenue. Tasting rooms, wine clubs, apps, et al all play a role here. CBInsights has developed the map shown below. The map identifies a list of Wine Tech companies entering the space targeting one or more areas of disruption. While it is easy to dismiss very traditional millennia-old wine industry, it seem it cannot escape the lure of technological innovations. Examples range from wine subscription services to rating apps, startups in the space are innovating more than ever before. Connected corks and bottles are starting to emerge, as well as algorithm-based recommendation features to better match personal tastes to wine. Comparing the Wine Tech market map constructed by CBInsights with the list of exhibitors at the 2018 Unified Wine & Grape Symposium, none of the 50+ companies could be found in the exhibitor’s list. This is intriguing… Could it be that they are on the waiting list of floor space for future Unified Wine & Grape Symposium trade-shows, as an executive at one of the incumbent companies responded? Or is it just possible that they are showing their wares at new trade-shows where the disruptors and the early market adopters attend? Provocative as it sounds, I lived through a very real experience in my professional journey, as data communications and eventually the internet created their own venues and conversations away from traditional, century old telecommunications industry trade shows, which were centered on voice communications. This is a far-fetched analogy, but could it be true? While we are still a while away from dial-a-wine, nutraceutical wines or a complete synthetic wine home production, there is no room from complacency. I say this not because of my expertise on the wine & spirit industry, but because of my conviction that the digital transformation is creating the perfect storm for each incumbent, in each industry. Each one individually or as part of a tectonic shift in its industry, and at its own time will be unable to scape and will likely face its own deconstruction and re-construction over the next decade. Disruptive forces will pound on the incumbents, and it will be compounded due to global competitive pressures, all vying to get hold of their revenues and profits. Until my next post – Carlos B.
 Italian, French and Spanish catholic missionaries were often the technology transfer agents bringing the know-how of growing vineyards and wine-making to new lands across all continents, beginning in the 1600s through the early 1900s. While the health benefits of wine are widely known, the nutraceutical food and beverage industry is still nascent. Analog to the way 3-D printing has disrupted the manufacturing, logistics and retail industries. In 2011, I was one of five general partners (GPs) who joined forces to start Alaya Capital Partners in Córdoba, the capital city of Argentina’s interior (and my home city). Just last Thursday (11/16/2017) at the Alaya Investor Day, we announced a new goal to have US$100MM dollars under management by 2022, capping a decade-long journey. And what a bumpy ride it has been! Given our unprecedented announcement a couple of weeks ago, I wanted to take the opportunity share with you the areas that I thought we got right, got wrong, and other areas where we clearly misjudged market and government signals. Among the most successful tools to stimulate entrepreneurial ecosystems are government programs that provide matching funds to facilitate venture capital (VC) formation (as has been the case in Israel and Chile, among others). As we launched our first fund (Alaya I) and formed Alaya in 2011, we expected to promptly receive matching funds from Córdoba’s provincial government that never materialized. Unfortunately, we failed to appreciate that these promises made to us by Córdoba’s provincial government suffered a six year delay. In retrospect, it’s hard to imagine a more challenging time to launch a VC fund in Argentina than 2011. The years that followed Cristina Fernández de Kirchner’s second term landslide general election victory in 2011 were among Argentina’s worst ever in terms of sociopolitical isolation, rule of law, and economic malaise. Nonetheless, we persevered. We were extremely fortunate since all of Alaya I’s limited partners (LPs) were from Cordoba, who were well aware of the difficult climate and stuck with us. We also earned our LPs’ goodwill by investing alongside them and by taking a meager (by market standards) management fee of 2.5% that wasn’t sufficient to cover our basic fund expenses. Alaya I ultimately invested in seven startups. These difficult circumstances over the ensuing years tested our team, and, since we refused to quit, led us to redouble our commitment to the fund. As we rushed to invest in Cordoba-based startups, it was inevitable that we would make mistakes despite our best intentions. Originally, our investment thesis was that local startups (from Cordoba) would scale well beyond Argentina and Latin America, into North America and other global markets. This actually never happened. These companies’ value propositions, financials, and their founding teams’ skills were simply not optimized to grow beyond Argentina’s borders. Few attempts were made to reach beyond Argentina into Brazil, Chile, and other Southern Cone countries; for the most part our initial portfolio companies, remained local businesses. We naively thought that, given the right selection process (which focused on team and scalable value proposition), we would be funding scalable ventures. We have learned many lessons since our first investment in Translation Back Office in 2012. We were happy that none of our portfolio companies died (died fast/fail forward). However, we now recognize that our selection process was far too conservative, and our co-founders too local. We faced significant headwinds, but we did several things right. Alaya was and remains investor-focused. We have conducted Alaya from day one with uncompromising integrity and ethics. Also, since investment performance is key, we have concentrated on the development of our portfolio companies. However, the support that we provided to these portfolio companies was unbounded and our advice often came across as too paternalistic, disobeying the Darwinian first principle of entrepreneurial ventures (“survival of the fittest”). Alaya CP, had a visible impact in the local Cordoba innovation and entrepreneurial ecosystem and many provinces of Argentina’s interior. We collaborated tirelessly with the local six universities, think tanks, Endeavor’s local chapter, other NGO’s and government agencies. Today, Cordoba the intellectual capital of the early 1900’s is regaining its position leading the startup revolution in Argentina. In late 2015, Mauricio Macri won Argentina’s general election signaling a dramatic change in the country’s leadership after 12 years of the Kirchner’s. While Macri started to implement his new economic agenda, we at Alaya were eager to take our lessons learned and launch a second fund (Alaya II). At around that time, we crossed the Andes from Argentina into Chile to participate in Chile’s leveraged fund program (x3) for early stage companies. The qualification process was arduous and took a full year to meet the multiple demands of CORFO (the Chilean Government’s economic development agency). Finally, in late 2016 we received CORFO’s approval and Alaya II was funded with $4MM of private investment and $12MM of Chilean leveraged funds. Today, our $16MM fund is on its way to become first a $20MM, and eventually by the end of next year, as large as $25MM, with its potential x4 leverage, if certain performance conditions are met. Alaya II, has, by all metrics, been a resounding success. Alaya opened its offices in Santiago and hired a team there, and eight investments (more than over Alaya I lifetime) will be realized by the end of this year (2017 – Alaya II first year of operations). Now that we’re two years into Macri’s term (and two years into Cordoba’s business friendly governor’s term), our national and provincial governments are now finally catching-up with the global startup revolution. Our new leaders’ rational management style, the reduction of corruption and clientism, and Argentina’s brand new Entrepreneur’s Law have combined to create an unprecedented startup friendly environment. Alaya intends to participate in many of these programs. But something else is happening: after a decade of being compared in the same breath to Venezuela and Cuba, Argentina is now distinguished with optimism and anticipation of an epoch of growth with emphasis in innovation and opening to global markets. Recently, Alaya has launched a corporate acceleration program with an emphasis on developing an open innovation platform for the leading Argentinean companies based in Córdoba. The Alaya team now extends from Córdoba to Buenos Aires, Argentina; Santiago, Chile; and Sausalito, California (San Francisco Bay Area). Our team is strong, diverse, and battle-tested. We are confident in our ability to perform in periods and geographies of extreme uncertainty, deal with the ambiguity that characterize the emerging Latin American economies, and also called by innovative businesses embracing new technologies, or supporting the global growth of our portfolio companies. However, one key milestone remains elusive to definitively prove our team: its ability to exit its portfolio companies with high multiples. Alaya is at the mid-point of its first decade and, for some of our investments, “Exit Time” is rapidly approaching; when we do finally exit, and return multiples to our LPs, it will be among the happiest blog posts I’ve ever written! The GP’s commit to invest 20% of the total fund capital. Actually, since the heydays of the modern-day pioneers of the Silicon Valley, it has produced hundreds of billionaires, a selective group of several dozen actually have accumulated tens of billions, and probably a few are pushing the 100-billion-dollar mark…but no trillionaires yet. This reductive measure of success — the financial metric — will likely add a new trillionaire benchmark in the coming decade, but this coveted space will, in my estimation, be reserved for those select entrepreneurs able to finally disrupt the health care industry in the United States first, and then globally. About the services that should be provided to every American, the answer seems simple: why not provide to everyone the same health care services that our congressmen and senators enjoy? I have never heard them voice concerns about pre-existing conditions, premium hikes, lifetime limits, or the services they enjoy for themselves and their families. So the benefits question seems settled. If they are our representatives from the people, by the people, and for the people, what is good for them should be good enough for the rest of us, as well, right? While most industries have enjoyed huge productivity increases during the last 4 decades as a result of the introduction of new technologies across all segments of their value chains, health care costs have continue to rise higher than inflation. More alarmingly, this industry has not produced any consumer surplus, as has been in the case in other industries — in part due to regulation, in part due to the massive size of the health care industry and the power of its lobbying effort. The latest statistics put health care expenditures in the US at pushing close to 20% of GDP, or about $3.4 Trillion in 2016, growing at a pace close to 6% annually. In other words, the US health care economy, if a nation, would comfortably have a seat as a member of the G7, and it certainly would have been part of the G20 meeting last week in Hamburg, Germany. I often wonder when price lists for the most common services will be published and visibly displayed in our medical waiting rooms or on the web sites of our health care providers of choice. Or when we will be able to enjoy comprehensive rankings of disparate medical specialties in much the same way we are able to enjoy rankings of restaurants, or auto mechanics. Obviously, those providers in my neighborhood offering best-in-class services (5 stars) at the least expensive prices (single $ sign) with over 500+ reviews (quality assurance) will suddenly enjoy a competitive edge! Presently, most medical treatments are marketed as kinds of art forms, rather than as routine, often technologically-driven processes. Why? Because, to justify high costs, medical practitioners need to emphasize the uniqueness of individual anatomies and circumstances, and de-emphasize the inconvenient fact that 90% of bone fractures, mole removals, and dental cavities are treated in the exact same way. This marketing dynamic is further facilitated by a widely shared natural fear of death, or at least our aversion to pain and suffering. In other words, we allay our qualms about overpaying with the justification that ‘it’s our unique life’. At a time where disruptive technologies mimicking human knowledge are applied to disparate domains, such as self-driving vehicles or human tissue/organ image diagnoses (radiography/ pathology), we should rightfully wonder how many ‘low hanging fruit’ in the health care are ready for disruption. Every day, millions of tissue samples, biopsies, x-rays, CAT/MRI/PET scans, et al are diagnosed by highly paid professionals throughout the world. I deeply believe that all that human talent should be liberated from the boring and repetitive task of diagnosis so that they can make higher value added contributions to medical science and in consequence to society. It is my hope that this will both (a) significantly improve our health care space at a superior price-performance point, and (b) empower medical professionals to migrate to new frontiers of health care, thereby enabling higher contributions to health care and to society. Along these lines, I am calling for the world’s first trillionaries to search for interesting market entry points and compelling value propositions, supported by innovative business models to disrupt specific sectors of the health care industry. Myriad innovations that break information and knowledge asymmetries will finally bring the democratization that has disrupted many other industries to health care. A global market of 8 Billions consumers by 2026 and 9 Billions for 2042 — all with the same bones, organs, and for the most part the same health care needs – are awaiting your irreverent disruption of the health care status quo. According to the OECD, the life expectancies at birth in Australia, France, Italy, and 22 other OECD countries all score over 80 years, while the US just scores 78.9 years. https://data.oecd.org/healthstat/life-expectancy-at-birth.htm. Artificial intelligence (AI), Big Data and Machine Learning are just a few of those emerging technologies. A reductive benchmark, to be clear, because not all contributions to society can be measured monetarily or in terms of accumulated wealth. Innovation and upward mobility across the socioeconomic pyramid: A reason for optimism or pessimism? This past week, I woke-up on November 9th to learn the election results of the nasty 2016 US presidential election. The results prompted me to finish this post that was already in the making for some time. While for many this election was about issues like race, gender or even immigration or other factors, I believe this election was ultimately decided by voters who felt massive economic insecurity. Last Tuesday (November 8, 2016), the election provided a channel for Americans, particularly those living throughout the so-called Rust Belt, to voice their collective economic resentment as they are increasingly left behind in an era of globalization and accelerated technology changes. In today’s post-election post, I will make an attempt to discern the impact of the accelerated pace of technological innovations on upward or downward socioeconomic mobility. Last September, I published Innovation: Impetus for Global Resentment?, in which I argued that for most of the last century, the professional re-invention process happened naturally as a part of generational improvement as parents sought better futures for their children. At that time, the variables of the time constant of innovation and lifetime expectancy were somewhat aligned, enabling a rather natural process for successive generations to capture the opportunities presented by new technologies. Each new generation could potentially aspire to a better lifestyle, afforded by higher paying jobs with higher value added, by embracing businesses enabled by technologies unavailable to prior generations. For the most part, education was the great enabler. Today, and over the next decade, global innovations facilitated by exponential technologies, will be deconstructing and reconstructing every industry and business, as we have known them. Each industry will have its own “Kodak moment” as digitalization, demonetization, dematerialization, democratization or for short massive disruptions target established incumbent businesses. As they continue to operate under old paradigms supported by old technologies, they fall prey to new business models and technologies embraced by agile new firms. This deconstruction and reconstruction of industries and their associated businesses will challenge the disrupted workforce to either: (a) resign to accept lower paying jobs at the base of the job pyramid, or (b) re-invent by gaining new skills in new areas with the hope of maintaining or improving the income level they enjoyed before the disruption happened. In this post, we explore how this deconstruction and reconstruction process will become a threat to those jobs in the mid-income range, polarizing society and increasing income inequality between the commodity jobs at the base vs. the high value added jobs at the top (see below, Figure 1, Job Compensation Pyramid). Each one of these transformations will impact firms (and their employees) on the winning and on the losing side of the battle lines. However, all these transformations will have in common, and as ultimate winner the consumer, as each disruption will bring what economists call “consumer surplus”, benefiting them by increased convenience and productivity, adding predictability to their lives at a lower cost. The consumer adoption of these new technologies will become irreversible, and once embraced, it will spread virally and get installed in our lives until the next new technological disruption. Obvious examples include digital photography and e-mail, since it is highly unlikely we would ever return to celluloid photography or post office (or fax) delivered letters. The disruptors “uberize” existing industries in few years, creating new customer value by introducing new products and services at lower cost (or no cost) and offering higher productivity and convenience. In fact, it is this new customer value that fuel the viralization and massive adoption by end-consumers or business customers, catapulting the disruptors as dreadful competitors of established companies now under threat. Whether is the taxi coop, a hotel chain or a photo parlor, they are all assaulted by the new entrants. Likely, these disruptors have limited or no prior experience in the industries targeted, however, they master the digitalization of businesses, new technological paradigms, and business model innovations; while enjoying access to capital from well-connected VC, Super Angels and other strategic investors. The investors’ motivation is dominated by FOMO (Fear Of Missing Out). They participate in a XXI century version of wealth transfer from the incumbents to the few global disruptors they fund. They place their bets by funding what they hope will become the future Amazon’s, Google’s or Facebook’s. The odds are tiny but the multiples enticing. Hence, money flows in the form of investments to these entrepreneurial teams seeking to build the next Uber by targeting the incumbents in the established industry to be disrupted. The disruptors are typically bright and energetic entrepreneurs often in their 20s and 30s with some or limited experience, unencumbered by the responsibilities of family or children. In many ways they have little to lose, not because they are irresponsible playing with others people’s money, but rather share the view that the challenge of becoming a disruptor is a worthy endeavor. A few years of their lives committed to a high risk moonshot, can provide and extraordinary learning experience, which if successful could make enough money for a lifetime. The hall of fame proves it is feasible, with new names being added periodically to those like Steve (Jobs), Larry (Page), Michael (Dell), Bill (Gates), etc. The incumbent companies are at large passive bystanders. Actually, most of the firms knew of possible threats beforehand, however, their response were lukewarm as they were tangled in their own internal processes, and management energy’s misplaced in internal politics and preoccupied in their own personal future while serving often dying customers. The incumbent firm focus was highly optimized in the established (old) technology and serving traditional customers, leaving its flanks open to the disruptors targeting emerging technologies and/or new customers. By the time the new reality defined by the disruptors emerges, is often too late and by then, their tepid actions are unable to reverse their fate, which by now is a painful decline and an irreversible death. In other words the firm faces its own “Kodak moment”. While management bears most responsibility, employees and supply chain stakeholders will suffer the most, affecting potentially hundreds of thousands/millions of jobs. In the absence of a well-defined action plan, many will be consigned to jobs with lower earning capacities and risk being jobless all together. For most individuals, their position in the socioeconomic pyramid is determined by their compensation. Figure 1 below identifies three areas of the socioeconomic pyramid as defined by the job compensation. At the base of the pyramid are commodity jobs typically compensated in the US under $20/hr. They tend to be workers performing highly standardized activities with little differentiation generally prescribed by simple rules or algorithms. They often require limited amounts of training and the individuals holding those jobs for the most part are easily replaceable. Examples of these jobs are janitorial service providers, painters, customer service representatives, fast food workers, etc. At the top of the pyramid are the highly compensated jobs (>$100/hr.). These tend to be professions requiring skills difficult to standardize. They often require knowledge and experiences that the market values highly, and are likely in limited supply. Therefore, these positions are generously rewarded. Examples of these jobs are plastic surgeons, board members, physicists, mental health professionals, most engineering fields, etc. The middle income jobs (between $20 and $100/hr.) are those most challenged. 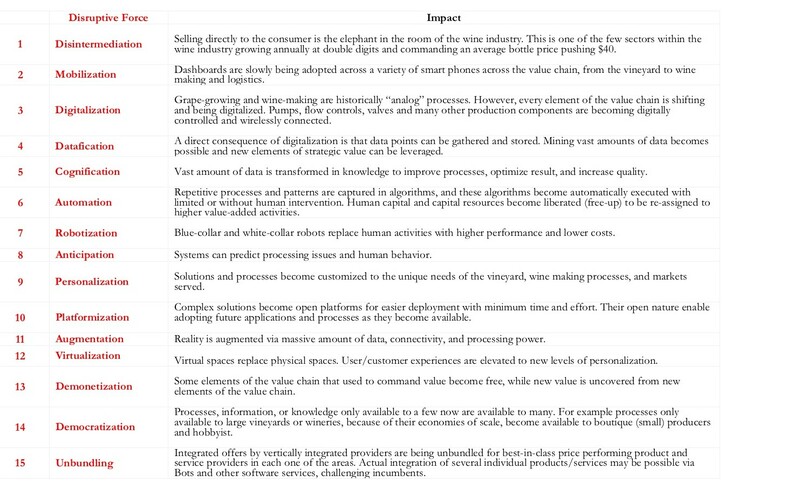 These are the positions susceptible to disruption by emerging technologies (i.e. digitalization, machine learning, 3D printing, AI and big data, etc.). These workers perform activities able to be targeted by blue and white collar robots, and are sufficiently paid to justify the ROI (return on investment) by applying these new technologies. In other words these are the jobs that large sections of society holds, often referred as middle class jobs. Examples of these jobs include traditional manufacturing jobs across many industries, first/second level supervisor and administrative roles, logistical operators, financial analysts, etc. Technological innovations do not know of “sacred cows”. Once considered “high value jobs”, at some point their protection erodes as new technologies are able to perform their functions better and more cheaply. The health care and legal professions have long been considered untouchable, but these too will feel a downward pressure from their positions of privilege. Furthermore, the average lifespan of each technology is shortening, often to less than a decade to complete its life cycle, instead of multiple decades, which was the life cycle of technologies for most of the prior century. Therefore, “Kodak moments” are becoming increasingly likely, with the unfortunate consequences of the destruction of shareholder value and employment. Re-invent by gaining new skills in new areas often borne out of one of the aforementioned disrupting technologies. Options (1) and (2) are self-explanatory and represent suboptimal solutions since they require accepting in perpetuity lower income levels, or working longer and longer hours to retain prior income levels. Option (3) brings some hope, yet requires the non-trivial decision of applying the time, effort and resources required to embrace the personal/professional re-invention process. However, the selection of the area of re-invention or what new skills to acquire cannot be left completely to individual choice; rather, this decision will require guidance emanating out of a concerted collaboration between government and the technology and educational sectors. Until my next post amigos – Carlos B. My own life experience is a perfect example. My immigrant father had only a 3rd grade elementary school education and my mother only completed 6th grade, yet their two children went on to college and completed graduate studies overseas. Fully loaded salaries, in other words, the gross salary plus the cost of the benefits paid by the employer. Innovation: Impetus for Global Resentment? Seismic global events such as Brexit, the rise of nationalistic movements, or Trump’s nomination as the Republican presidential candidate here in the United States, are not isolated phenomena, but actually have something in common: both appeals to citizen fears. Over time these accumulated fears lead to collective resentment across broad sectors of society motivated by income stagnation, job losses, increased socioeconomic inequality, etc. Daily headlines in the global media identify simplistic targets, when they are actually pointing to visible consequences, rather than identifying root causes or, even more rarely, possible solutions. In this blogpost, I would like to connect the accelerated pace of global innovation as one of the root causes of today’s painful societal structural cracks, which are exacerbated by a longer life expectancy of the population. Citizens feel increasingly disconcerted by the speed of the disruptions they experience, feeding individual fears into collective resentment. We can commence our thought experiment by considering the introduction of the Ford Model T in 1908, which sought to replace the horse-pulled buggy, the prevailing mode of transport in society. This disruption was as big as any of today’s eminent disruptions. However, its impact was felt over decades since society was slow to adopt this new technology. Hence, individuals who made a living moving goods or people via the incumbent technology (the horse-pulled-buggy) were slowly phased out over a period of time. Not only was the adoption much slower (the automobile took about 5 decades to reach approximately 60% of US households), but the average life expectancy of those affected, or disrupted, by the advent of the motorized buggy, was relatively much shorter. Following the same example, a Caucasian male conductor of a horse buggy in 1911 of age 30 would be expected to live to age 63.8. Assuming he would be able to work until age 55, he would likely have another 25 years in his occupation without disruptions. Given that the threat of being replaced by the new technology took decades, it is likely he would be able to retire in his mid-fifties without being significantly disrupted by this new technology. Let’s envision now a more current scenario: a Caucasian male 30-year-old photographer/dark-room developer of film (or celluloid) photography in the year 2004. Here, the likelihood of his being disrupted before age 35 is extraordinary (2004 is approximately 5 years after the market introduction of digital photography), since digital photography took only 7 years to be embraced by 60% of US households. Our hypothetical photographer would be left with about 30 years of productive life before retiring. Clearly, he will need to reinvent himself, not once, but possibly multiple times throughout the rest of his professional journey. Our hypothetical photographer is not alone in his drama. The transition from film to digital was so rapid (only 7 years to penetrate 60% of the US households) that it would have been very difficult for him to reasonably foresee the severity of its impact. First, this disruption democratized ownership of a camera by dematerializing it: each smart phone included a digital camera, as well as a myriad of apps whose effects would be profoundly felt by the entire photography equipment sector. But the damage did not stop there, since that same disruption demonetized many of the revenue streams of the photography industry, e.g., the copy and print photography sub-industry. Hence, our hypothetical photographer had abundant company. The disruption of the entire film photography industry was devastating, indeed. Our hypothetical photographer’s challenges, unfortunately, do not end there. The living wages he was able to earn as a photographer have quickly eroded as many of the tools of his trade have been dematerialized, demonetized, and in consequence democratized. This example is thus far different from our example of the horse buggy conductor, who could possibly have continued in his profession into retirement or death. But our photographer has seen his livelihood and living wages at best quickly eroding and at worst completely disappearing. As innovation and adoption patterns accelerate, the need to re-skill and re-train may occur several times in the lifetime of an individual, requiring a constant process of professional reinvention. Every aspect of our human activities has been, is being, or will be disrupted over the next decade. The way the incumbents created economic value has changed or is in the process of changing. While incumbent technologies and their operators fight with tooth–and–nail to preserve the status quo, most of the time the allure of the benefits resulting from demonetization, dematerialization, and democratization offered to the consumer become too attractive to pass up, rendering disruption inevitable and irreversible. However, a fraction of those very same consumers would become disrupted as a result of their behavior. While it is easy to intellectualize a constant process of reinvention whereby society continually harvests ever increasing rewards from the market by increasing the amount of economic value added, the implementation of that process is far more challenging. For one, re-invention takes resources, time and dedicated effort. Even if these three conditions are simultaneously met for any given individual, it remains unsolved, the identification of the area of re-invention. Distinguishing technology fads from real strong and durable trends is often hard to distinguish, especially in its early stages, even for the trained eye. All together re-invention is often a fearful and distressing proposition, transforming the sum of individual fears into collective resentment. Furthermore, governments and policy makers are ill-prepared to guide our hypothetical “film photographer” for his journey of periodic reinventions, because their policies are often predicated on antiquated economic models, e.g., industrial societies. Actually, government employees, due to the protected nature of their jobs, are often incapable of understanding the realities of these market disruptions, augmenting the resentment of the affected private citizens. Lastly, the globalization of innovation adds to incumbents’ accumulating fears as new unheard players from remote geographies threaten the incumbent firms and the jobs of all those they employ. Those that lobbied hard for free trade a few decades ago, now lobby even harder to return to protectionism with the hope of avoiding the blows of disruption. The often pronounced statements of politicians to bring back old manufacturing jobs is misguided and counter-productive. If China or Vietnam wants to continue assembling combustion engine vehicles we should let them do it, while we lead in the development of electric self-driven vehicles…. But, wait a minute… did I just say electric self-driven vehicles? Then, we will need to address the fears of all the Uber and Lyft drives, gasoline station operators, etc., etc…. as they will all be massively disrupted. My hope is that I have provided in this post a context for the unsettling reality that many today are experiencing in their professional careers. In my next post, I will explore possible opportunities for solutions. No doubt that in the meantime, we should be prepared to think carefully about the reasons for growing global resentment and challenge our politicians with hard questions that consider the complexity of the issues. Let’s not allow them to get away with the often overly simplistic solutions of the soundbites they propose. Keep in mind that in the ensuing years many older colleagues left the profession due to retirement of death, delaying any possible effect to our hypothetical Caucasian male horse buggy conductor. Taking many casualties in the process. Kodak, the undisputed leader of film photography and, counter-intuitively, the inventor of digital photography. Performing incremental improvements, which in retrospect often result in too little––too late changes.